Discussion in 'Evaluating and Criticising Scientology' started by Gib, Feb 5, 2019. "If words control you, that means everyone else can control you"
yes this is true I think. You have to realise for yourself though that you HAVE been controlled by someone or some group with words before you can really understand this and can avoid it in the future. So you have to have been controlled, somehow extricated yourself, and look back at it as an experience to avoid again. And words have no power to cause you to go aneten if you should chose to not know the word, deeming it not relevant enough to merit the endless divings down the rabbit holes of dictionary definitions and clay demos. Hubbard planted that bug in our heads and I had clam friends who were so in agreement with that that they literally slumped over when they'd hear you use a word that they didn't fully understand. They were at MUST KNOW which is the ultimate trap and Hubbard put them there as a control mechanism! Because now he had you, you HAD to look up and wallow in everything he ever said or wrote plus you had to remain on course 10 times as long just to play word chase with them. Yes the word clearing "tech" is where Hubbard closed the deal and cinched his stranglehold over you. None of the rest of the Scientology implant would have taken root in your psyche if not drummed in through the hypnotizing repetition of full scale word clearing being imposed when you're just trying to get through a course that should take a few days rather than months. Plus Scientology seemed more right because the dictionary seemed to be telling you that it was because of the dissociative state of mind it put one in and the validity of Scientology was entangled with the validity of the dictionary. The two became confused as one in our subconscious. But I wouldn't say subconscious or hypnotizing. I'd say it was was just repetition and rhetoric. And it eventually became what would Ron do? So here you are clearing words on Ron's PL's, HCOB's, Lectures, everything Ron said or wrote. And there then you become a Ronbot, aka Scientologist, doing what Ron said to do, and if you disagree with Ron's PL, HCOB, Lectures, etc, why you are PTS/SP. If the words SP and/or PTS control you? That means one fell for Hubbards words. Using dictionaries is a good idea however Hubbard abused the use of dictionaries. Word clearing was a way of saying you were "stupid". To stupid to know you were stupid. Especially the small easy words. I only say hypnotizing because it all went into some sort of feedback loop in our subconscious and played back through trigger words such as SP & PTS as you mentioned. Another key reinforcement of the Scientology implant that I forgot to mention was what happened when we were on break from our academy courses. We had to fend off reg's who pushed more of their concepts and goals upon us not to mention all the twinkle eyed course mates who stood around in the hallways and gushed about how "keyed out" they've become and how their "awareness" was expanding by leaps and bounds. We as social animals attempt to fit in so pretty soon we too were raving like lunatics about our "wins". But the key to it all was all the grinding we were made to do on word definitions whereby all of the Scientology was put in a mixer with all of the undeniably true word definitions straight from the Merriam Websters and blended into one where Scientology gained a vicarious and comparable status as equally true as the very dictionary our language is based upon, the two became inseparable to us. It was all blended into one to give Hubbard's ideas legitimizing status entirely by design. You haven't truly experienced word clearing until you've done it in session @ hundreds an hour. oh I have. I wish I would have made copies of all of my student points sheet one fills out after every course period. Plus all the words I cleared in method 1. Plus all the words I cleared during every auditing session to "clear" the commands. Must be in the millions, must be even higher for others who have done the whole bridge to serfdom. One of the things that keep me going was Hubbard's word of being super literate. Anybody remember that? Oh, the sublime (philosophy) of being super literate. Super Literate = M1 word clearing followed by fast flow Student Hat. If the student still disagreed with some items in Student Hat HCOBs, even after further word clearing, would they be routed to an Ethics Officer and assigned a lower ethics condition? actually I believe it was doing the Primary Rundown. Your best defense against that is to know words, but just sitting back and breathing can leave you open as well. You are better off to know exactly what is being said to you, and then act accordingly. People are careless with words and assume wrong meanings at times. That's what gets you in trouble. I was lucky to have cleared all those words while on my training package so that I never had to spend time on it in session. In auditing I just f/n ed my way through my grades with the mindset of "Oh yeah, he's running the process that I drilled with so and so on". It was that familiarity with the processes prior to my auditing that really kept much of it from biting on me. In some cases I found myself mouthing something I realized while training on the level and then, boom, I was off to the examiner! To bad I had to use the money I'd spent securing my OT levels before the price increases in the late 70's & 80's in order to pay for my grades but perhaps it saved me from wasting my time on them. 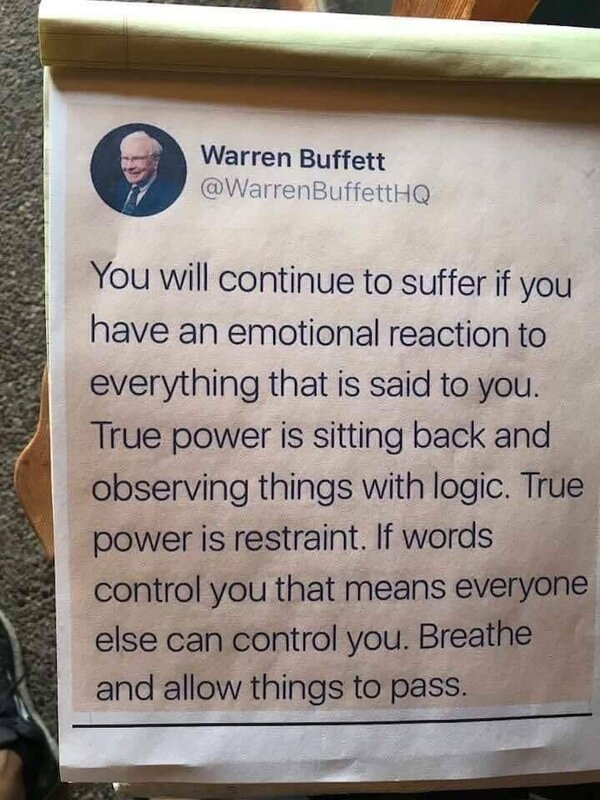 you are not including what Buffet said, which is having a emotional reaction to words. In the book dianetics, Hubbard said after a few hundred hours at most, one could become "clear" and any two people could clear themselves. And the definition of "clear" by Hubbard, well you all know. And the same story is trying to be promoted to this day by the DM church of scientology. As Warren says, sit back and observe things with logic. In other words, don't get excited by clear or OT words by Hubbard, observe if any. Yes, I did see that point and I did see you were leading down a trail like that and that does happen. The point I was trying to make but didn't make very well is the emotional reaction can come from having the wrong definition, no definition or the right definition but taking it the wrong way. I think that is why you have to take the whole situation into account which is in line with what you are saying by not reacting first but evaluating it first. Buffets quote says "words", not a single "word", that's the difference. Emotional reaction comes from words, and not from a single word.